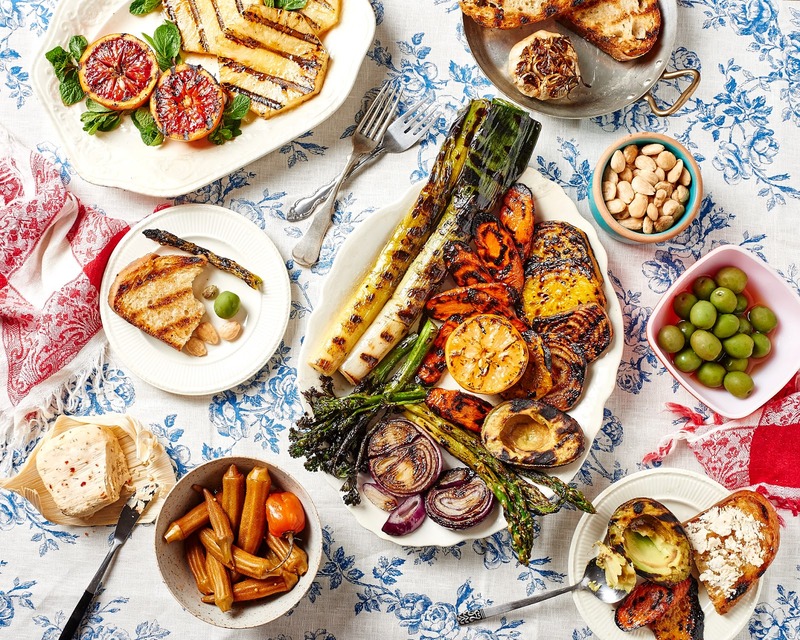 F for Food: Grill Your Garden. Emerson Rose is almost ten months-old. Just like that. Crawling, laughing, 'talking', responding, acting, reacting, selecting, loving and eating. This kid loves to eat. She's amazing. Almost as amazing: Spring has finally arrived - sunshine, warmth, green, flowers, short sleeves. As she was born late last Summer and spent her first few months being teeny tiny, and fragile indoors, Emerson has not yet been able to be IN the air. And what better a time for her to be with all this exploring and adventuring she's getting into. She squeals with delight swinging on the swing, is fascinated with the sandbox (and it's apparently very delicious sand), and the grass (with it's equally palatable dandelions), and is 100% happy on any and all walks in the stroller. And, man alive, this girl is head over heels for baths and swimming. We're even inflating the baby pool this week! It's also great for Fred and me. We can do so much more now that our world has opened up beyond the walls of our home. And cooking beyond the walls of our kitchen. Most notably, to our backyard and grill. Emerson and I can sit in the grass, swing on our tree swing, nibble on the herbs in our garden, while Fred flexes his testosterone on the grill. To make our world expand a little bit more, we can even walk a block away and have the same operation over at my dad's house – minus the swing. The perfect burger. A grilled hamburger and a beer. That was the original plan for this post and photo. And, I won't lie, I was the littlest bit deflated when I heard about the change of plans. Not just because I like to eat burgers, but I have been anxious to polish up on my burger styling skills. Same goes for the beer (except for the drinking it part - yuck). But the great minds at Little House Green Grocery, who sponsored this post, wanted a grilled vegetable extravaganza. So, let them eat kale! When Fred and I went in to case the case (of produce) har har)), we were dubious. Leeks, broccolini, asparagus, sure. But beets, carrots and blood oranges? So we hit the books to find recipes and techniques for all things grilling. And then we grilled and we grilled and we grilled. Last night, we invited my dad to join us for The Big Grillorama: All Veg All the Time. As he is a big meat eater, he was wary and had a rack of lamb chops ready to throw on the grill when the cooking space was freed up. Turns out, meat: it's not what's for dinner. Or, it wasn't last night. Some olive oil, some salt. That was pretty much it. 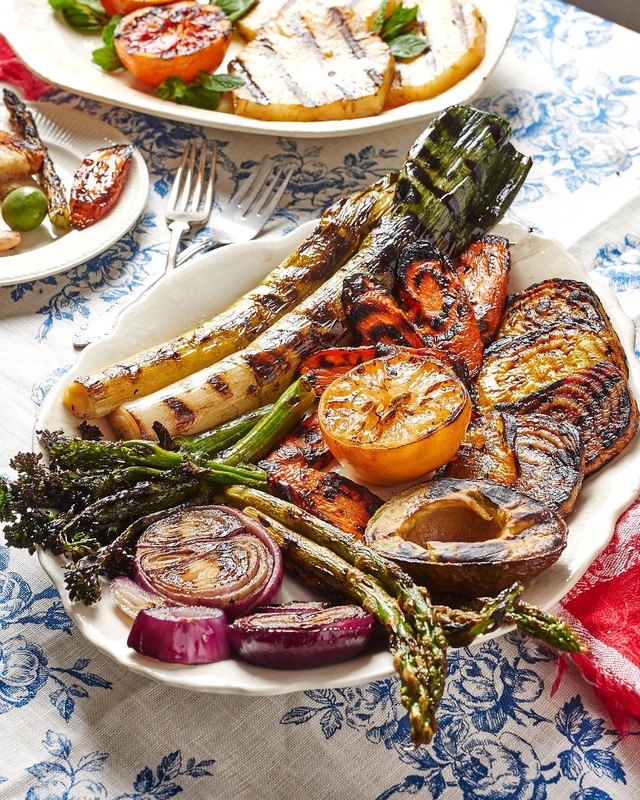 All three of us were awed, impressed and inspired by these grilled veggies. Even better, Emerson could eat almost all of it. Her favorite was the asparagus (her first asparagus pee). So simple, so colorful, so healthy and so delicious. And the show stoppers? Those beets and carrots. WHO KNEW? My dad even called me today to ask for the recipes. And a picture of Emerson eating the sandbox. marked, flipping once mid-way through. or the bell or whistle of your choice. *This applies to the above asparagus, broccolini, red onion, pineapple, lemon, blood orange, beets and carrots. Just make sure to cut the more substantial vegetables thin enough to cook in a timely manner, like the carrots and beets; they should be about ¼ inch thick and need a few more minutes than the other items. Start them first. *The bread and avocado are just thrown on the grill for less than a minute – just enough to get those lovely grill marks. *The leeks must be par-boiled prior to grilling, but otherwise the above applies to them as well. Thank you so much! Grilled beets are where it's at!